Well, I had intended to write something up regarding the 2013 season week by week. Due to some personal and business related reasons, I haven’t found the spare time mid-week to start writing. And once the weeks rolled on, I just decided to wait until after the regular season was over. The last regular season game was on Thursday, November 7th in West Virginia. It was my 50th game this season I attended. 48 full games and two finishes to other games. At the close of the regular season, I’ve seen games in six states (Kentucky, Tennessee, Ohio, Pennsylvania, Maryland, and West Virginia). I’ve seen 85 different teams play from eight different states (those previously mentioned plus Virginia). For those most interested in out-of-state competition, we’ll start with Week 0 and Week 1. Week 0 started with two doubleheaders in Kentucky. Starting with the VisitNich.com Bowl in Nicholasville, KY. I had seen their two games last year at West Jessamine HS but came away unimpressed. The homes teams (West and East Jessamine) aren’t good, and the stadium was abysmal in layout (facing into the sun for an extra early start for the doubleheader). However, this year the games were at East Jessamine HS on the other side of town. And the stadium still had major issues. Starting with the fact you’re about 50 yards from the field in the closest row of seats. Luckily there’s a small slope from the first row down to the track which rings the field. East and West Jessamine again lost their games. Though West Jessamine was slightly more competitive in their matchup with Covington Scott (KY). The next day was a doubleheader at Western Kentucky University’s L.T. Smith Stadium in Bowling Green. This is a very nice small college venue. On par with Nippert or InfoCision. These were the Rafferty’s Bowl games, sponsored by a local eatery. Only downside is the concessions are much higher, and the parking garage next door was the closest parking. Mercer County (KY) defeated Allen County-Scottsville (KY) easily. The nightcap was the homestanding Bowling Green Purples (great name) hosting Lexington Catholic. Though, it was almost identicle to the first. Mercer County won 48-20, and Bowling Green won 48-21. On Sunday morning, it was an early game at Station Camp High School in Gallatin, TN. Unfortunately for Tennessee, they appear to build Division 6 level venues for massive Division 1 level schools. This stadium was tiny. I arrived an hour early and wound up standing three deep along the fence. I finally gave up my spot there, and stood in the endzone and track. Which meant I lost sight of the scoreboard. I had to look through or over a tent setup in the green space between the endline and the track. Only benefit was I was right next to the drink vendor and on this blistering hot day bought about $20 worth of water. This game was a matchup between homestanding Station Camp hosting local rival Beech of Hendersonville. Station Camp is the newest school in Gallatin, but they greatly underestimated their drawing power. Their visitor stands could probably hold about 500 if they sat skin to skin. I did not enjoy this game despite it being a very exciting game broadcast nationwide on ESPN on a Sunday morning (part of the appeal of attending). Defenses were spotty, but they were fast. Beech won a barnburner 42-39. After the game, I drove back up to Bowling Green to catch the end of the minor league baseball game (Bowling Green Hot Rods). Then it was the long drive home. In Week 1, it was on to Cincinnati for the Skyline Chili Crosstown Showdown. This was my third year going to games here. I was a bit disappointed that there wasn’t the big four-game block on Saturday. This was because of the Cincinnati Bearcats season starting that weekend and most games were scheduled for other days. Wednesday was the Sheakley Athletic Center doubleheader in the heat. Thursday was the doubleheader at Kings Stadium. I had figured on watching more Showdown games on Friday and Saturday but balked at it. Mostly because the heat was extreme in the Cincinnati area that weekend. Eastern Kentucky offered a much better weather situation and some stadiums and teams I’d yet to watch. Finding out another fellow high school football fanatic was attending both doubleheaders, I decided to make the drive to Belfry, Kentucky for the Pike County Bowl. The first doubleheader was at Belfry’s CAM Stadium on Friday. This is a beautiful venue. Mountainous surroundings near the West Virginia border. Henry Clay (KY) overpowered Pike County Central in what was a clear mismatch, 52-14. The night cap was the perennial power, Belfry Pirates hosting the Somerset Briar Jumpers. I had seen Somerset win easily the previous year at West Jessamine. Belfry was a clear favorite and pulled it off, 37-12. I had contemplated a three-game Saturday back in Cinnati. Which, I’m glad I passed on. The Boone County (KY) game was moved to an earlier time, and the late doubleheader at Centerville was postponed to Sunday. But, instead it was on to Pikeville, KY for the second day of the Pike County Bowl. The stadium in Pikeville (KY) is quite unusual. The stands are only on one side of the field and are actually the centerfield outfield wall of a baseball field. The diamond is just beyond the far sideline. It also features another unique feature, a club level section in the corner to the left of the stands for VIP and media. Now, the first game had an interesting backstory. East Ridge (KY) had opted out of the Kentucky playoffs and played an independent schedule. This was primarily due to playing teams way beyond their ability. Consolidating down boosted their enrollment into a level that had no business being in. Because of this, they played a small school from Hurley, Virginia. Hurley was decent. For East Ridge, they made it entertaining and were definitely playing with schools closer to their ability. They still, however, lost 36-14 at Hillard Howard Field. The headliner of the night was Pikeville vs. Hazard. This was easily a top five game on the year. Hazard led 28-21 at the half. Three third quarter touchdowns for Pikeville made it 42-28, including a beautiful 85-yard screen pass that seemed to start putting the game out of reach. And it did. Pikeville kept their foot on the pedal and scored two more touchdowns to take a 56-28 lead halfway though the fourth quarter. To say that the game seemed out of reach was an understatement. And then, a great seven minutes happened. With 6:22 left, a 35-yard QB draw made it 56-34. With 5:04 they scored again to make it 56-42. Less than a minute later, they scored again to make it 56-50.Finally, Pikeville found time to breath and got a decent, quick drive to make it 62-50. But, with less than two minutes to go, Hazard wouldn’t give up. Driving down the field again, they were finally stopped with an interception near the goal line. A kneel down ended it and Pikeville walked away with a 62-50 epic game that saw 63 second half points and 42 of those in the fourth quarter. Now, I had opted to head home after this instead of back to Cincinnati. Mostly because I had been out and about for four days and had plans for Monday and wanted some good rest at home. However, I was up to 13 games on the year. Now, for the remainder of the regular season, I’m not going to go week-to-week. Mostly because the dates seemed to follow a general pattern. Thursday games were the most interesting, and in one case frustrating. Some notes and stories. Most of these games were going to be the Pittsburgh Root Sports televised games. However, some decisions were made due to matchups or logistics. Pine-Richland Stadium north of Pittsburgh is on par with Bedford’s Bearcat Stadium. It is impressive. A very wealthy community north of Pittsburgh really put some money out. This school was 3A and has grown to 4A recently. And they don’t look to stop. Montour (Week 7) had a similar stands on one-side setup, huge stadium, little parking. The game was a bit of a let down. Though, I did enjoy seeing Blackhawk lose. And the Gateway (Week 9) game was set up as a collosal matchup of undefeated teams until Gateway lost the week before to surprise bracketbuster, Penn-Trafford. McKeesport, who I had seen earlier in the year, won this pretty easily on an extremely windy and frigid night on the east side of Pittsburgh. Antimarino Stadium in Monroeville is nice, but again all the seating is on one side. And, the stadium looks to the west. Which wasn’t an issue given the late season game time had the sun setting by game time. The North Hagerstown game was played at the high school, but the field is apparently used for the local college which explains a lot of the enhancements that South Hagerstown doesn’t enjoy. Namely a large brick facade and field turf. But, again, all seating on one side. Urbana had a great running game and just pounded the Hubs (intersting name, more on that later) mercilessly on the ground. Week 5 was in Clarion for their Autumn Leaf Festival. I had attended the previous year and enjoyed it and decided to go back. Clarion is a small school that plays with a high flying offense and a very stingy defense. Through eleven weeks, they’ve outscored opponents 613-to-39. They’ve scored 62 or more four times, and have never scored less than 42 so far. And their defense is no slouch, posting eight shutouts on the year. The Rimersburg Union game was no different, as they won 62-0 and went scoreless in the fourth quarter. The Madison-Geneva game was a rainy night up near the lake. Not sure exactly why for the Thursday game, but it was enjoyable. I got there just as they were scoring their first, and apparently game-winning score as they too posted a shutout. The Indian Valley-Tuscarawas Valley game is apparently always scheduled for a non-Friday to avoid competing with the Dover-New Philadelphia game. Again, it rained. Not heavily, but enough to get you wet without a poncho. Indian Valley was pretty good in the rain, but the Trojans kept it a bit closer than most would have expected. Highlight of the night for me was winning the Ohio State helmet raffle. Tusky Valley had a very nice stadium and would like to see another game there if they host again on an off-night in two years. And the last game was a bit of a late season surprise. Bishop Donahue and Tyler Consolidated were scheduled to play on Saturday night but had other teams competing the same day. To facilitate fans to see those other sports, they opted to move their game to Thursday. Since this was Week 11 and after when Ohio and Pennsylvania conclude their season, I had no expectation of another Thursday game this week. But, I made the trek down to Monarchs Stadium in Moundsville, home of John Marshall Monarchs for the game. It was cold. The crowd was small. But, it was an enjoyable day and I finally got to see a game in Moundsville. Great seating from goal line to goal line on both sides of the field. And lastly, I’m going to vent on the Week 4 game that never was. My original Week 4 plan was to see a game in Williamsville, NY on Thursday. Then drive down and get a hotel in Clearfield (PA) and see their game on Friday. Then drive down Saturday morning in Rockwood (PA) and then at 5pm watch Forest Hill (MD) host Erie Central Tech (PA). It began with Rockwood cancelling their season and nobody updating it. I found out two weeks before the game. Without a second Saturday game, I opted to avert the trip to Maryland (and the Clearfield game) and only drive to New York and back and witness games in the OH-PA area. Which would include my first trip to Sharon (PA) for the Greenville road game there. My first trip to Sharon Tiger Stadium. However, I had checked the day before and the morning of the game. I then drove to Buffalo. After arriving at Williamsville South High School for the game (their stadium was hosting the Williamsville North-Williamsville East game), I found nobody getting ready for a football game. A soccer game was concluding at an adjacent field. I looked online the best I could and find nothing. I asked a guy in the parking lot if he knew anything and said he wasn’t sure. But, his friend’s son plays for North and would call him. Sure enough, the game was postponed until Saturday afternoon. It was too late to see any other game and I had drive a few hours up there for no particular reason. Later, I found they had updated their schedule on the school site, but it was a day-of-game decision to postpone. Leave it to New York to mess with my plans. The next section is the Saturday games. Every week was an early and a late game. Preference was made for places that don’t usually play on Saturday if possible. This is always for a variety of reasons. From homecoming (common) to lack of official (uncommon). First, weekends with ‘non-regular’ Saturday games. Week 2 was a doubleheader of new places. McKeesport had decided to make their first home game a homecoming game and decided to make it an afternoon game as well. The reason was their former coach had come back and because of interest, wanted to make it the game all by itself. It was a beautiful day at Weigle-Schaeffer Memorial Stadium, too. And with McKeesport winning, there’s a good chance they may keep up the tradition of an afternoon homecoming game. The night game was at Mercer, PA. This was because of a lack of officials for the number of games in the area that Friday. They hosted Sharpsville, the defending District 10 Class A champion. The Mercer Mustangs defense is no joke and the made a single score hold up, 6-0. Week 4 had a lot of games postponed due to storms, but I didn’t try to attend any of their conclusions. Instead, it was an early non-lighted stadium game and the night cap was at Cleveland Heights. The game was originally scheduled for 2pm, but they had moved it back to a night game. Now, from the sounds of it Heights has some issues with financing and their school falling apart. Their stadium isn’t that far behind. I’m not a big fan of wooden seating or decking. However, the location and view from the Cleveland Heights homeside at Hosford Stadium is amazing. The school dominates the field to the East. Definitely an interesting place to see a game. And the team wasn’t bad, either. Week 5 was Shaler’s regular afternoon homecoming game played on Saturday afternoon. The town has made it a big event. Too bad the football team can’t make it entertaining. Hosting a fellow winless team, they still got whooped 34-14. The big problem with this field is that if you do not get there really early, you’re parking, literally, a mile away. No parking on the streets. And nobody has front yard parking for games. The overflow for their small lot is a public park a few streets over. And, it’s uphill to the stadium. Not fun. Week 6 was a rehash of last year’s hosting teams. Ambridge regularly hosts a Saturday afternoon game at their beautiful Moe Rubenstein Stadium. The visitor side is still the old crumbling concrete, but the home side is brand new and impressive. An actual bridge is built into the top of the stadium to span the gap to the school, giving it a very unique view from the visitors side. A rain storm soaked my during this game as I hadn’t prepared for rain that day. I was heavily fortified for the night game and the rain wasn’t much. Both years, it rained for these games. Unlike the pervious year, Beaver’s homecoming opponent was a bit weaker and Riverside didn’t put up much of a fight before falling 62-29. Week 7 was the greatest finish to a game I’ve seen all year. Canton McKinley’s touchdown return and then their fake field attempt for a touchdown as time expired will go down as one of the gutsiest, amazing finishes to a game that had one team appearing completely out of it for 44 or so minutes pull it out in the end. And lastly, is Week 10. Maple Heights was hosting Bedford. And again, it rained. Heavily. A grass field at Stafford Stadium made for a very eventful game and neutralized Bedford. Maple Heights, though couldn’t get much going, either. But, after a fumble return in the third quarter to break the scoreless draw, taking chances for Maple Heights became the norm and they just couldn’t get any traction to put it in the end zone before losing 18-0. The best run of the night was by Bedford for 35 yards and a touchdown where everyone was ‘slow-motion running’ to avoid slipping. The ensuing PAT sailed about 5 yards as the weak kick hit the headwind and held it up. Then, there were regular Saturday games. First, the two games in north-central Pennsylvania. Sheffield has an amazing stadium. In fact, it’s one of the most beautiful settings a game could ever be played at in my eyes. They do not have lights. And that’s a good thing. They call it, “Wolverine Mountain”, and they’re not kidding. Situated near the top of a tree-covered Allegheny Mountain named Wolverine Mountain, you see nothing but mountains in all directions. The school sits to the south and the roof is just barely visible before the opposing sideline. All the stands are on the home side built into the hillside. It’s quite a walk from the parking area to their field, however. But, it’s worth it. I do have photos from this year, and the ones from this game are my most impressive I’ve taken with my rather meager digital camera. I had originally planned to see three games here this year. Their home finale was scheduled against Youngsville (PA) in Week 10. I was then going to watch the Erie Central Tech-Erie McDowell game for the night cap. However, an interesting thing happened in Sheffield. The team was winning. Finishing the regular season 5-4, they had just eeked out enough of a conference record with the win over Smethport to win the Allegheny Mountain League-North Division title. This was Sheffield’s first regular season title since 1964. And most years, they’ve never come close. But, a mix of other teams being bad, and them pulling off wins when they needed it secured their spot in the AML Championship Game. Which is scheduled for Week 10. The AML teams who win their division cancel their scheduled non-conference games and play a championship game against eachother. Which I will get to in a moment. But, the game against Smethport (nicknamed the Hubbers), was one of the more exciting and gripping games. The fans of this very small school were behind their team 100%. Great atmosphere that I won’t forget. After seeing both of those Sheffield games, I would drive down to St Marys, PA to watch Elk County Catholic host their night game. Sharing Dutch Country Stadium with the public school, their games, other than homecoming, are at night. Usually on Saturday night. Their football team is down this year. One great thing about making this trip is to drive through Kane, PA and stop at Texas Hot Lunch. A eatery that’s been open almost 100 years and serves some amazing burgers, gyro, Texas style chili dogs, and other Greek food. A few trips near Cleveland saw day games at Beachwood and Shaker Heights. First time to Beachwood was again with some light rain. Rather nice grass stadium. And Cardinal was a poor match-up. Three weeks later, I went to Shaker Heights instead. I may have liked Cleveland Heights stadium, but I loved Shaker Heights’ Russell H. Rupp Field. The stadium is built off the back of the school and recently renovated. A nice scoreboard to the north end. Field turf. Grilling some great burgers there. And just the location of the school in the large circle in Shaker Heights is a great setting. A shame the crowd wasn’t as big as the stadium could hold. But, they do live up to their mottor of a community being known by the schools they keep. The night games were generally at Warren JFK if I didn’t have somewhere else to be. Hosting Sharon area high schools Brookfield (OH) and Sharpsville (PA). JFK just couldn’t keep it up for long to compete. Week 10 was going to be the Warren JFK-Cleveland Central Catholic matchup, but I opted out with the Warren unrest and a matchup I wasn’t keen on witnessing. Instead, being in Maple Heights, I decided to attend the game nearby in Bedford between Trinity and Western Reserve Academy. Again, it rained lightly and had some moderate wind throughout the game. Temperatures were dropping and a 40-7 game makes it a bit underwhelming. Bearcat Stadium, though, is definitely a place to see a game. And lastly in the list, are the Friday night games. Now, I’ve rarely been in Steubenville this year for games and have been attending Greenville (PA) games for personal reasons. My alma mater lost in the PIAA District 10 semifinals last year and were looking to improve. Greenville had started their season with a win over North East during Week 1. Their second game was a matchup with defending PIAA District 10 Class AA champion Hickory Hornets. The Hornets jumped out to a 21-0 halftime lead on the backs of three Greenville turnovers. After making soem defensive adjustments, Hickory could not do antything the second half and Greenville scored a touchdown while missing the extra point. Then a safety and two more touchdowns with the extra points put them up 22-21 with 4 minutes left. They whethered the comeback attempt by gaining two interceptions, including one in the final minute near midfield to hang on. Week 3 was a mercy rule contest against winless Saegertown at home. After the game was over, I went down the road to Reynolds, who share a Greenville zip code, for the conclusion of their game with Grove City. Reynolds was down 30-7 before scoring a touchdown and two-point conversion right as I arrived. With 7 minutes left, Reynolds scored again to make it 30-23 with the two-point try. Grove City got a TD with 2:37 left to make it a two-score game again. With a minute left, Reynolds scored again to pull within one score, but failed on the onside kick. As mentioned above, my plans for Week 4 had fallen apart. Having never seen a game at Sharon, I opted to stick with my alma mater and watch their game at Sharon Tiger Stadium. As some may now be aware, their team lost two players to a tragic car accident this weekend, and two more were seriously injured. A third person also died in the accident. Their game that night was a great one, though. Greenville had to withstand a fourth-down attempt inside the redzone to win 21-16. After the game, I drove a few miles south to Farrell to watch the last quarter of the Farrell game that was running long. Farrell was up and finished the game off with a score and a two-point conversion to put it away. 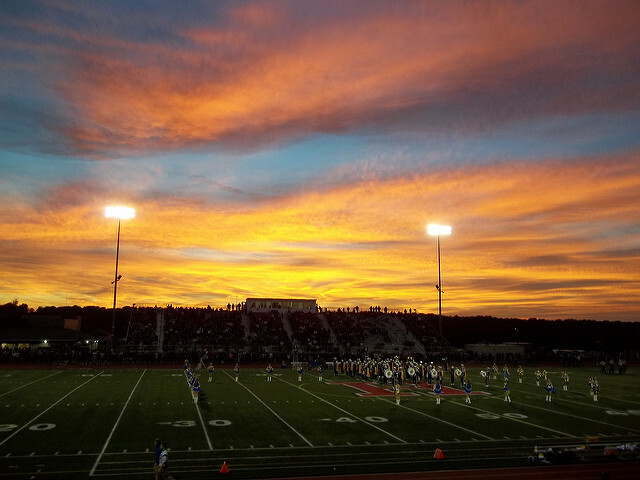 Week 5 was down in Steubenville for the Massillon-Big Red game. Not quite the result I was hoping for. Steubenville was decimated in this game with injuries and Massillon just could not be worn down. Greenville, meanwhile, was at Grove City that night and led off the game with a kickoff return touchdown. It wasn’t ever really in doubt as they ran away with it. Week 6 was a game against Titusville (whose only win was against winless Saegertown). This was also the first, and only, shutout on the season. Given that Greenville tends to let off the gas and put the backups in early, shutouts rarely happen. Seagertown, for example, was scoreless into the third game when they finally scored on Greenville’s backups. Meanwhile, Sharon had won 67-0 and was up 61-0 at the half against Saegertown the previous week. It’s just how Greenville plays. Which can be infuriating as a 41-0 win doesn’t appeal to state-wide media in polling when they don’t beat someone by as big a margin as others should (like Hickory’s 77-0 halftime score over Saegertown). Week 7 was against Region 4 leader and fellow unbeaten Northwestern Wildcats. Northwestern had an early 7-6 lead via a missed PAT for Greenville. A touchdown and two-point conversion made it 14-7. Northwestern then mounted a drive to score again, but they too missed a PAT. And that was the defining result as Greenville posted a win in a potential playoff-preview. Week 8 was rivalry week with crosstown rival Reynolds in what is locally known as the Backyard Brawl. Reynolds covers the mostly rural area south and west of town while Greenville covers the two and the area just north before reaching Jamestown. Thiel College had given free use of their stadium for this game (and the next two years). This was scheduled as a Reynolds home game. Alumni Stadium at Thiel College holds about 1600 people and about 1800-1900 with standing room. Greenville’s stadium, though seats about 4,500 plus tons of standing room. So, next year, this could be an issue. However, playing on turf at the college was an interesting experience for both teams. First ever high school football game held there. Preivously, Thiel played at Greenville’s Stewart Field for years until building their own field in the late 90s. Greenville withstood the challenge, and won 20-6. Week 9 was more of a coronation than a competition. Greenville had already clinched a share of the Region title, and would win the tie-breaker with Sharon even with a loss. But, a victory over Wilmington (2008 State Champions) would give them an undefeated Region record and an undisputed Region title. They won easily 41-21. This also set up a game that meant nothing in Week 10. Having already clinched their spot in the playoffs (as did the other seven class 2A teams), there was nothing to play for in Week 10. Greenville had a road game scheduled at Harbor Creek, who were 1-8. Week 10 left me some decisions. Though it would be fun to see the Greenville game in person to witness an undefeated season (something I saw in high school regularly), I decided to go elsewhere. I had previously planned on attending the Sheffield-Youngsville Week 10 game on Saturday afternoon with a family member. With the game cancelled because of Sheffield’s winning of the AML-North, they had a matchup with the Kane Wolves in Kane on Friday night. So, we opted for this game instead. It also gave us some time to sight see on Friday afternoon. Visiting old Kinzua Dam and the remains of the Kinzua Bridge, now called the Skyway. For those uninitiated, the Kinzua Bridge was the tallest train bridge in the world when it first opened. It had since closed to train traffic, and was a tourist attraction. It was set for rehabilitation almost ten years ago when it was struck by a tornado, falling several of the massive supports holding it up. It’s quite impressive, even today, to go there and see the destruction one tornado can do to something so massively built by man. One of my favorite memories as a young kid was crossing that bridge on foot. Then it was on to Texas Hot Lunch and a walk around town. Then, it was over to the stadium. Now, I’m not one much to criticize a school’s stadium more than just pointing out its aesthetics. Wooden stadiums, though, make me nervous. However, Kane’s Paul R. Miller Stadium has one glaring deficiency. The visiting side is pathetic. Deciding to sit on the Sheffield side meant barely being able to see the game. The home side is a massive hillside structure about 30 yards long and stands about 40-50 up the hillside. The visitor side is temporary bleachers, five of them, that have a maximum height of about three feet off the ground. You can’t see over the crown of the field from how low you sit. The stands are situated on dirt, that turned to mud quickly. And the only bathrooms here are on the home side in the corner of the endzone, which is surrounded by a track and outer fence. Concensions require circumnavigating the field and track and then climbing up the hillside steps where it’s at the top of the hill behind the school. A genuinely horrible setup that shows little care for the visiting fans. The game itself started well for Sheffield, but they could just never get a score early. Kane meanwhile systematically drove the field, though not always scoring. But, as the scores slowly mounted, it was certain the undefeated Kane Wolves were not going to be taken down by Sheffield’s miracle run. As I did in previous years, I’ll write a recap at the end of the season regarding state-by-state opinions. I will write weekly playoff recaps if time permits. This past week I was in Buffalo for six games at Ralph Wilson Stadium. Next week I’ll be there on Thursday for a doubleheader. The next week will be the quadruple-header at Heinz Field for the WPIAL Championships. In two weeks, I’ll be in Canada for the Ontario Provincial Championships (9 gamess in four days from Tuesday through Friday, of which I’ll see the Tuesday-Thursday games). Then to Detroit for eight state championship games. First week of December will be the OHSAA Championships in Stark County. The following week will be the four PIAA Championships at Hershey. And the following week will be a small vacation to Texas for the ten UIL Championships at AT&T Stadium. I’m figuring on about 102 games for the year. Currently, I have photos from games from 2011 and earlier online. I will post 2012 and 2013 photos as I have time. Most likely after the season is over. They’re currently available at http://www.flickr.com/sykotyk/ . As of now, I’ve seen games in 27 states. Since 2010, including the 56 games I’ve now seen so far this year, I’ve attended 285 high school football games. And, I’m also a Cleveland Browns season ticket holder.